You may or may not be aware that your fellow Muslim neighbours and friends are going through the month of Ramadan – where they fast from dawn till dusk. Ramadan is an auspicious time for Muslims; wherein one reflects and contemplates much on the relationship we have with God Almighty. The days are long and we have worshippers coming into the centre throughout the day and late into the night for their prayers. This can indeed cause an inconvenience for our non-Muslim neighbours; for which we apologise in advance. We feel privileged, that as a pillar of the Eccles community, we provide a facility where we can accommodate and help open the fast of the local Muslim populace. We would, therefore, like to cordially invite you, our fellow neighbours from all faiths or none, to share in this festive and wonderful experience by welcoming you to join us for the annual Iftar Meal. We would be honoured if you would accept our invitation to break bread with us and in essence ‘Taste Ramadan’ with us by partaking in a delicious and hearty meal cooked by our local chefs; on 27 May 2018. The event will comprise of a meet and greet; a tour of the mosque, a look at the communal preparations for the breaking of the fast as well as a short presentation; followed by a full meal and the opportunity for networking. We shall be grateful if you could kindly confirm your participation by email and arrive on site for 08:00 pm. This is so we can ensure you are able to take part in our pre-iftar programme and served in time for the breaking of the fast at approximately 9:21 pm. If you have any specific dietary requirements please do let us know in advance and we will attempt to cater to your needs. If you have any further questions or queries please do not hesitate to contact me. Eccles and Salford Islāmic Society also known as The Eccles Mosque. 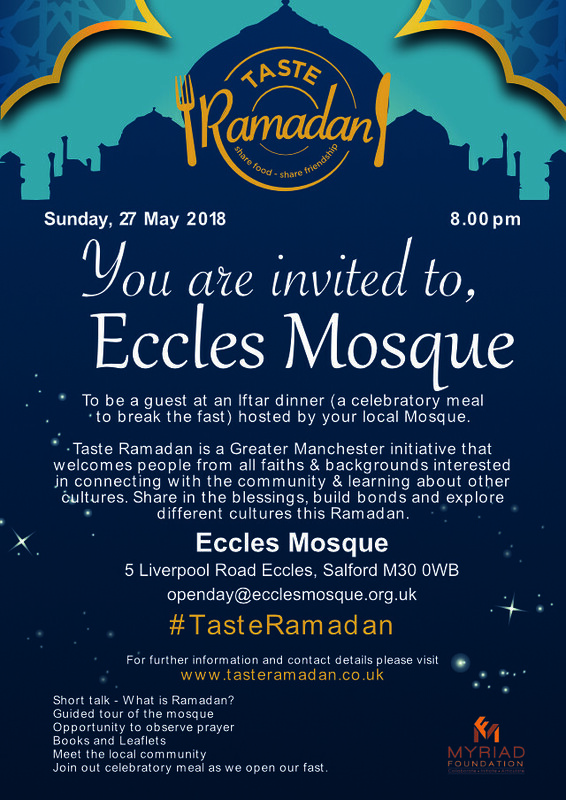 Eccles Mosque is a UK registered charity. Registered Charity Number 516270.